Lafayette, La. 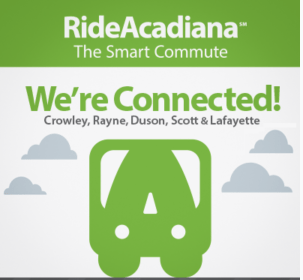 – Following a seven-month pilot program, Ride Acadiana’s final day of service will be April 5. The pilot route began last August to test the feasibility of a commuter bus transit route connecting Acadia Parish and Lafayette for increased access to employment and education opportunities. Boulet expressed appreciation to the riders who have participated in the pilot, and to partners in the program: University of Louisiana at Lafayette, South Louisiana Community College, Lafayette General Health, and the governing bodies of Acadia Parish, Crowley, Rayne, Duson, Scott and Lafayette. The pilot route was funded by a grant from the U.S. Department of Agriculture, with support from the Louisiana Department of Transportation and Development. The Acadiana Planning Commission administered the program through an operating agreement with Lafayette Transit System.